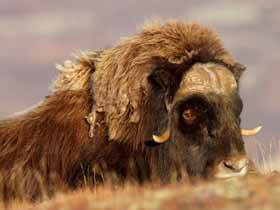 Musk-oxen live in herds, thess herds range in size from 8-24 individuals depending on the season. They can be found in the more mountainous areas of Norway. They feed on grasses, lichen, woody plants, mosses and will also eat Arctic willow. They breed in June-July and males will fight each other by charging at each other with their heads lowered until one of the males is defeated. They weigh up to 400kg but can reach speeds of 37mph (60kph)! 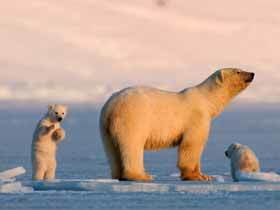 Polar bears can be found in Svalbard near the coast where there is sea ice. Polar bears are the largest species of bear. A male polar bear can weigh between 300-700kg, whereas females are about half the size. The polar bear's main source of food is seals. 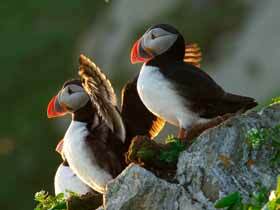 The puffin is easily recognisable because of its short colourful beak. They can be found on and around the coasts of northern Norway. Their diet consists almost entirely of fish. They breed in late spring and either nest in burrows in the ground, or where soft ground isn't available will nest in rock crevices. The eggs are incubated by both parents for around 40-45 days. There are thought to be around 30,000 reindeer in Norway and around 10,000 on Svalbard. Reindeer feed on lichens, grasses, ferns and shoots of deciduous shrubs. They are a social animal and live in very large herds. 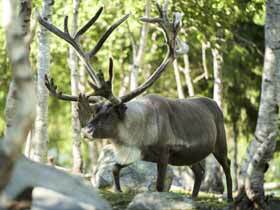 Reindeer in winter grow thicker fur, this fur even covers their antlers. They moult their thicker fur in the summer. White-tailed Eagle or Sea Eagle nest along the entire coast of Norway. 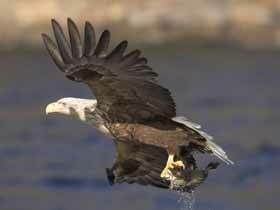 They are the largest bird of prey in Europe with a wingspan of up to 240cm. They feed mainly on fish but will also eat carrion, hares and other birds. They are monogamous and remain in their pairs for life. 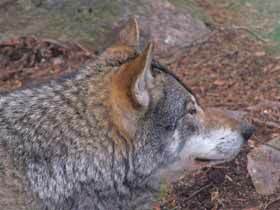 Wolves in Norway live mainly in forested areas close to the Swedish border, in fact many individuals' territories cross the border. They are often seen in packs of up to 15 wolves. They have a varied diet and will eat anything from a Moose to a Hare; they will also feed on carrion. Wolves are considered to be critically endangered in Norway. Beluga whales are also known as white whales. They are found in the northern reaches of the waters around Norway and are often seen off the coast of Svalbard. They can be up to 5 metres long and weigh up to one and a half tonnes. They feed primarily on fish and crustaceans. They can be found most commonly in pods ranging in size from 2-20 individuals, though pods of up to 100 individuals have been recorded. Harbour Seals can be seen along the entire coast of Norway. When they are on land they gather in groups of 10-20 seals on beaches, intertidal areas and rocky outcrops. They feed on a variety of fish and will also eat crustaceans and some cephalopods. The pups can swim as soon as they are born. They are about 1.5 metres in size and can weigh around 100kg. There are thought to be around 3000 Killer Whales living in the Norwegian and Barents Sea around Svalbard. Males are usually larger than females with males growing to be up to 9m long and weighing up to 5.5 tonnes, whereas females grow up to just under 8m and can weigh up to just under 4 tonnes. They feed on fish, seals and other marine animals and will even attack blue whale calves in order to feed. They often work together to catch their prey, for example by herding fish into tight balls. Ringed Seals live on the land-fast ice on Svalbard. They grow to between 1.1 and 1.6 metres and can weigh between 50 and 100kg, with males being larger than females. The Ringed Seal's main predators are Polar Bears, Greenland Sharks, Killer Whales and occasionally seal-eating Walrus. 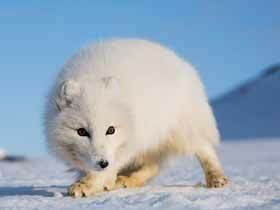 The Glaucous Gull and the Arctic Fox will, if the opportunity arises, eat the seal pups. The pups are able to hold their breath under water for over 10 minutes and dive to depth of around 90m. Sperm Whales can often be seen off the coast of Norway during the summer. They can be as large as 60 feet long and have the biggest brain size on earth. The sperm whale feeds mainly on squid (both colossal and giant), but will also eat various fish. They can dive up to 3,280 ft and can hold their breath for up to 90 minutes.